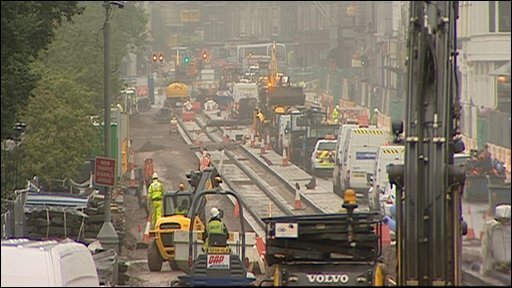 The final cost of Edinburgh's tram project could reach £750m - £250m more than originally planned, according to an MSP. SNP MSP Shirley Anne Somerville also said sources close to the project said trams may not start running until 2013, two years later than expected. She called on project manager Tie to release latest cost figures. 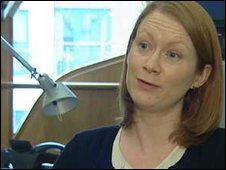 Edinburgh City Council leader, Jenny Dawe said Ms Somerville was "purely scaremongering". The project's cost was originally estimated at £498m. The nationalist MSP for the Lothians, Shirley Anne Somerville, said: "I am very concerned that a number of sources I have been speaking to close to the project are estimating large overruns with the largest being £750m as the worst case scenario. "But even the best case scenario we are still looking at £650m. "On the delivery date, we are looking at some people suggesting 2013, which is a two year delay on the trams being up and running. "I think the people have a right to know how much this project will cost and they will lose faith in the new management of Tie unless they get that information." Jenny Dawe, Edinburgh City Council leader, said: "The funding situation and projected delivery date for trams running on the street has not changed since being reported to the council last month. "The dispute resolution process is currently underway and both the council and Tie are committed to ensuring that we come in as close to budget as possible. "Speculation from Ms Somerville is purely scaremongering - a fact backed up by her inability to substantiate her sources." Mandy Haeburn-Little, Tie spokeswoman, said: "Not only is this information incorrect but it is deeply damaging to the positive progress of the Edinburgh tram project. "Categorically there is nothing to suggest that the programme will extend beyond 2012 as had been stated publicly. "The programme is making good progress and is on track to be clear of Princes Street at the end of November as planned."